Unwind from the day while sipping wine and sitting on your nostalgic front porch with metal roof. Listen to the fountain and enjoy the beautiful pond view in your home ideally located on a street with a cul-de-sac. 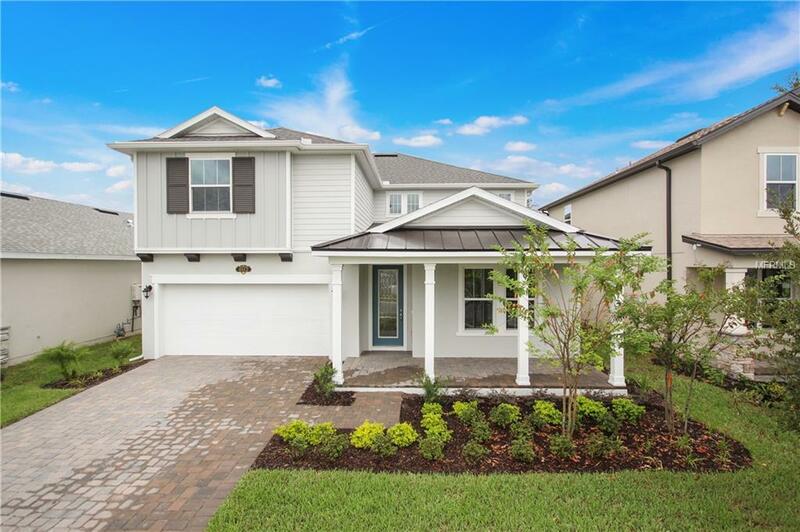 READY NOW, this inviting ENERGY STAR Certified home features 4 Bedrooms, 3 Baths, LOFT, Covered Lanai and a 2 Car Garage. Formal dining room perfect for special occasions with loved ones. The chef-inspired kitchen is open to the great room with plenty of natural light and features 42" cabinets with crown molding, quartz countertops, stainless appliances (including GAS cooktop & double ovens) and walk-in pantry. First floor secondary bedroom is perfect for visiting guests or as a study. Stunning 6"x36" Wood-Looking porcelain tiles in all common areas. Large upstairs loft gives you space for a game area or secondary living space. The oversized MASTER SUITE is a must-see with its adjacent SITTING AREA and large walk-in closet. Relax in the spa-inspired master bath with dual sink vanity with quartz counters, Garden Bath with soaking tub & semi-frameless glass shower, and privacy lavatory. Quartz counters in secondary bathrooms. Increased curb appeal with brick paver porch, driveway & walkway. ENERGY STAR features with R-38 Insulation, 15 SEER HVAC and Tankless Gas Water Heater provide savings with Low Utility Bills. Located close to 417, UCF, shops and dining. Clifton Park will offer residents a Community Pool, Clubhouse, Firepit and Playground. Additional Lease Restrictions Refer To Hoa Docs.